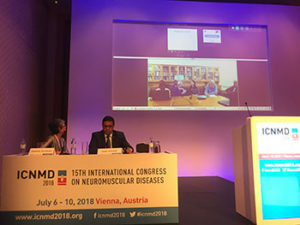 The 15th International Congress on Neuromuscular Diseases (ICNMD 2018) took place July 6-10 in Vienna, Austria. 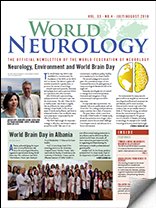 The congress was organized on behalf of the Applied Research Group on Neuromuscular Disorders of the World Federation of Neurology. There were participants from 69 countries at the ICNMD 2018. 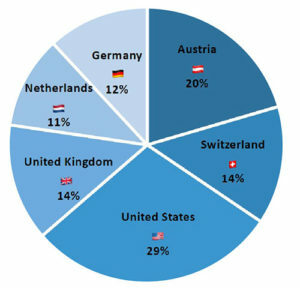 The distribution from the top 6 represented countries is shown here. The venue for ICNMD 2018 was Austria’s largest conference hotel, the Hilton Vienna Am Stadtpark. Combining the magnificent location in the heart of the city with great amenities and services, the Hilton Vienna provided the perfect location for the meeting. For the first time, a conjoint meeting was organized with the European Federation of Autonomic Societies (EFAS). Joint sessions were organized with the Peripheral Nerve Society (PNS) and the European Neuromuscular Centre (ENMC). The congress was attended by over 1,450 delegates from 69 countries, which made it a truly international event. This great participation showed that there is a continuous need for neuromuscular research and treatment worldwide. The meeting was preceded by a day of teaching courses. For the first time, a hands-on teaching course in cooperation with the Anatomical Institute of the City of Vienna was organized by Prof. Meng. Only a small group of participants were able to participate in this course and experience ultrasound on anatomic specimens, which were also demonstrated in detail later in the course. Participants received a botulinum toxin introduction, which was presented by Prof. Truong. For the scientific program development, the online blogging tool “Basecamp” was used. The blog contained a headquarter channel, and each topic channel and its content access was limited to ICNMD committee members and organizers. The general congress information and program development announcements were delivered by the organizers via the headquarter channel, and the program ideas were shared by committee members, each via topic channels that they specialize in. This sharing blogging system gave the whole committee an interactive program development process, which was highly appreciated by the individual members. For the first time, ICNMD also hosted a Public Patient Day (held in German only). More than 70 people participated in the Public Patient Day raising questions on neuropathy, muscle disease, and myasthenia among others. The ICNMD 2018 Opening Ceremony represented the Austrian as well as the Viennese culture. Classical music by Franz Schubert and typical Carinthian folklore built the musical framework for the official opening of ICNMD 2018. Prof. Wolfgang Grisold, ICNMD 2018 Congress president and Master of Ceremony, had the honor of welcoming Mag. Beate Hartinger-Klein, the Austrian Minister of Health, Prof. John England (ICNMD) and Prof. Walter Struhal (EFAS 2018 president). 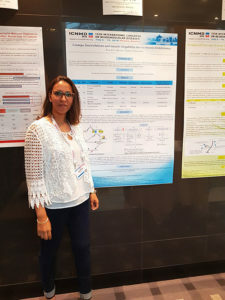 Dr. Laïla Belarabi in front of her poster at the ICNMD 2018 in Vienna. She is the recipient of the ICNMD-WFN training position in Rabat, and was invited by the ICNMD congress to attend the Vienna meeting. Furthermore, the ICNMD – WFN Fellow Program Winner, Dr. Laila Belarabi, training in Rabat, was honored during the ICNMD opening ceremony. The scientific program was divided into four main topics: muscle disease, peripheral neuropathy, motor neuron disease and neuromuscular junction. Each congress day was devoted to one of these topics and started with a plenary session followed by scientific breakout sessions and problem-oriented workshops. ICNMD 2018 incorporated innovative ideas into its scientific program which introduced overarching sessions and joint sessions with EFAS, Peripheral Nerve Society (PNS), and European Neuromuscular Centers societies. The congress also brought new subtopics such as cranial nerve diseases and aspects of cancer on the PNS. Another innovation was an interactive virtual session with an HIV Research Center in Cape Town, South Africa. Three cases were presented virtually by speakers from Cape Town, which were discussed live with the audience at the congress in Vienna. This new session type helped in solving an unforeseen speaker travel issue where one of the plenary speakers was unable to travel from Japan. He was able to use the same virtual session method to deliver his presentation virtually as well as interact with delegates in real time. The well attended plenary sessions were recorded onsite, and the videos will be made available to the delegates on the congress website as well as the WFN website. This meeting also demonstrates the important need for interdisciplinary and multiprofessional collaboration. The congress was able to present several new treatments, and new therapies such as gene therapy, enzyme replacement therapy, new immune therapies, and others mark a new area in the treatment of neuromuscular disease. These novel concepts were not only part of the scientific sessions, but also several industry supported satellite symposia of high quality. High traffic and much interaction in the exhibit hall allowed delegates and exhibitors to network and share the most up-to-date information in the field. In addition to the neuromuscular topics, the congress also integrated palliative care and patient related issues into the program. Several historical epochs also were discussed in the history session. A total of 357 posters were presented throughout the three guided poster sessions. All posters were reviewed onsite by the invited poster chairs using a mobile-friendly poster rating page. Based on the submitted evaluation results, eight Best Poster Award winners were selected, and the winners received a certificate and Viennese souvenir during the closing ceremony. ICNMD2018 has been accredited by the European Accreditation Council for Continuing Medical Education (EACCME®) with 34 European CME credits (ECMEC®s). Through an agreement between the European Union of Medical Specialists and the American Medical Association, physicians may convert EACCME® credits to an equivalent number of AMA PRA Category 1 Credits™. To round out the extensive scientific program and to allow more time for delegates to visit with colleagues, the congress offered various networking opportunities. The President’s Committee Mystery Dinner (invitation only) showcased the beauty of the Danube with a short boat ride followed by a traditional Austrian fish dinner in a traditional Austrian restaurant along the river. The ICNMD 2018 Congress Dinner was held at the historic Vienna Town Hall. This prestigious venue represented traditional Viennese flair. After a delicious Austrian dinner, participants were introduced to the Waltz and could give it a try themselves. Finally, delegates were invited to a Heurigen Evening, a traditional Viennese wine tavern where delegates enjoyed the typical Viennese “Gemütlichkeit” by enjoying some delicious Austrian dishes and wines. The closing ceremony highlighted the great success of ICNMD 2018. 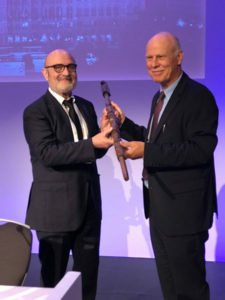 Prof. Juan Jesús Vílchez Padilla was inaugurated as the congress president for ICNMD 2020 with the traditional handover of the ICNMD trophy, a wooden stick carved by indigenous communities of the city of Vancouver. The 16th International Congress on Neuromuscular Diseases (ICNMD 2020) will take place July 10-14, 2020 in Valencia, Spain. ICNMD 2022 will take place in Brussels, Belgium. The international cooperation needed to organize and develop the scientific content by the congress and scientific committee worked smoothly.